You can give extended access to clients if you want them to see time entries and budgets. You can edit this at any time easily. You might have clients (managers, CEOs, financials) to whom you'd like to give a permission to view time entries and costs for a particular budget in real-time. This eliminates the need for sending timesheets to clients, as they can always log-in and be up to date with everything. 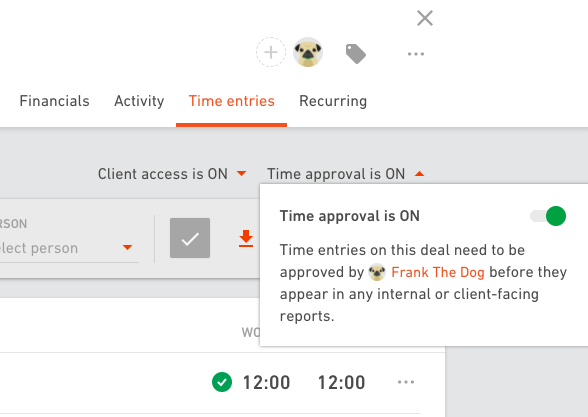 Before you give access to timesheets to your clients, think about whether you want to use Time approval feature. If you turn Time approval on, a person responsible for the project will have to approve every time entry before it becomes visible to clients or any other internal reports. If you don't turn Time approval on, everything that's been tracked will be visible to your clients immediately. Now that you've decided whether you want to use Time approval or not, you can give access to budgets and timesheets to your clients. The first two steps are the same as for any other client. Step 1: Invite your clients to Productive and have them sign up. Step 2: Add them to a project you're working on. 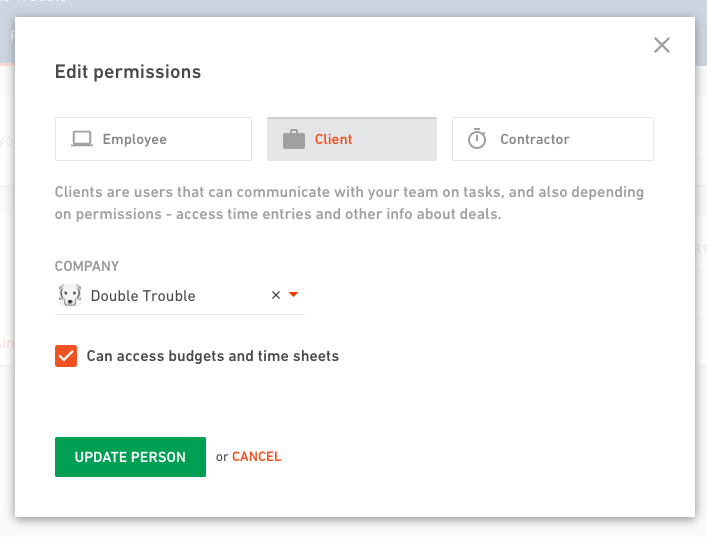 Step 3: Find a client you want to set up permissions for. Step 4: Open their profile and select Edit permissions from the menu. Step 5: Check the Can access budgets and time sheets box and Update person. At this point you only said that this client will be able to access budgets and time sheets, but you still didn't say which budgets exactly. So, checking this box doesn't give your client an insight into anything yet. Let us show you how this looks from a client's perspective. But there are still no data in this two tabs. You still have to explicitly define which budgets you want to give access to. Step 6: Go to the project and switch to Financials tab. This is where you'll see all the budgets for this projects. 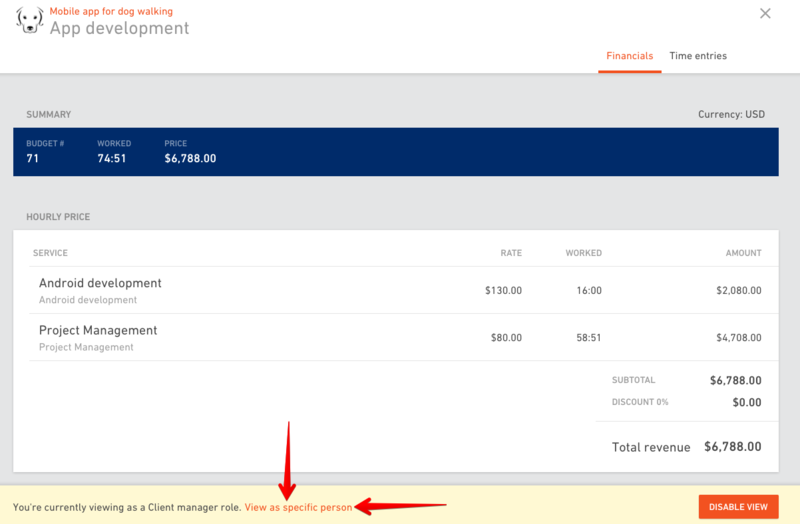 Step 8: Click on a budget you want to give your client access to and switch to Time entries tab. If you opted for the Time approval feature, you'll have a Time approval switch showing up. 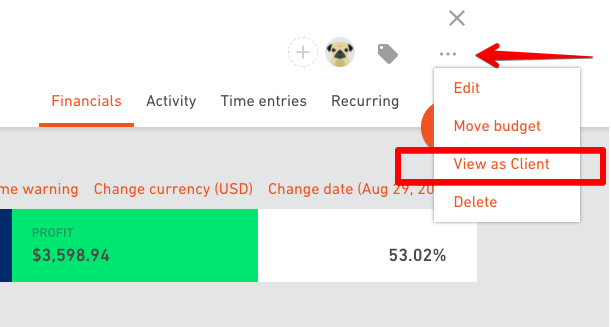 If you didn't turn this feature on in the Settings, you won't have the Time approval switch in your budgets. 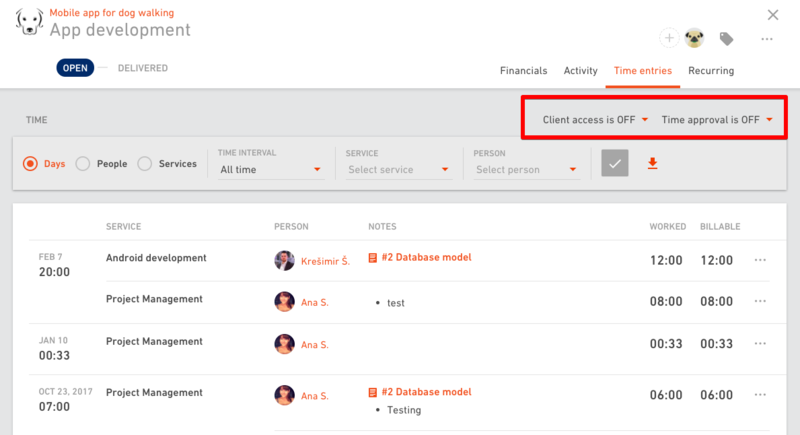 Step 9: Turn on Client access switch to give your client access to time sheets and basic financial information for this particular budget. Step 10: Turn Time approval on if you want to approve tracked time before it shows up to your client. Now that you've given access to a budget to your client, you're probably wondering what exactly do they see. This is why we added “View as a client” option to budgets. Turn it on and you’ll see exactly what your clients sees on this page, basically you’re viewing the budget “Through their eyes”. Want to know more about approving, editing and deleting time entries? Difference between worked hours and billable hours? Check this article.